How architecture and landscape art have combined to beautify the American summer capital - a striking demonstration of what wealth and taste can do. cold formalism and the oppres­sive atmosphere of great riches. As if loveliness lived only in Bohemia! 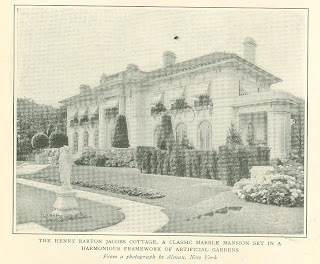 Bellevue Avenue - which, unfortu­nately, was planned in the early days of American town building - is not all of Newport. 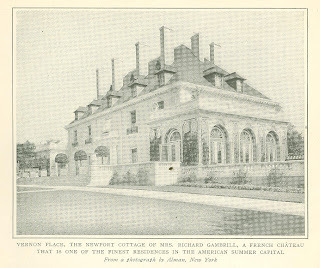 Many of the mistakes made in its beginning have been rec­tified at great expense and after careful study; and when the grandeur of the Ocean Drive, the serene pastoral beauty of Coddington Point, and the cliffs, with the ocean tumbling at their base, are considered, the avenue, with its smart present-day aspect, fades into nothing­ness. The history of Newport, the Indians' "Isle of Peace," has no less interest for the student than the town itself possesses for the visitor. There is an atmosphere of romance, a hint of the past, in each old shingled house and stoop-shouldered shop. If only those dingy stores on the wharves could speak, what tales they would tell of life and love, and of death, too! There are heavy iron chains and rings still in the cellar walls of many of these buildings, showing where slaves were secured while their importers and their prospective purchasers discussed business details above. There is an old dwelling on the Point in whose cellar Captain Kidd's money is supposed to have been buried, although historians declare that the worthy pirate was buried several years before the house was built. The tradition persists, in spite of the skeptical antiquarians. The Bull house, on Spring Street, built by an ancestor of Dr. William Tillinghast Bull, still points backward to the days when Roger Williams was a living force in Rhode Island. All these specters of the past have been deserted by fashion, and yet they have had their effect on the formation of the new Newport. In spite of in­congruities of architecture and occa­sional garishness of detail, there hovers over the cliffs and the outlying points of the Ocean Drive an atmosphere un­known to other American resorts. Newport's beautiful gardens are one of her greatest glories. Their creation has been almost entirely a work of recent years, and it has given a truly marvelous demonstration of what wealth and taste can do. Of course, old time Newport had its gardens, but they were not like those of today. The Marquis de Lafayette, the Comte de Rochambeau, and the Vicomte de Noailles used to frequent the pleas­ances of the Point, which was then the "court end" of the town. In the quaint old gardens sloping down to the quiet harbor, where beds of roses, phlox, lobelias, and hollyhocks were bordered with prim, self-conscious lines of box, the gentlemen of France spent their leisure in talking with the gentlewomen of the Colony. In commemoration of quiet hours passed in one of those water­side retreats, M. de Noailles sent to Mrs. Thomas Robinson and her "amiable, charming daughters" a tete-a-tete tea service of Sevres. The house of Quaker Tom Robinson arid the gift service re­main to this day, but the garden has disappeared. Fashion has moved from the "court end," with its narrow, twisting byways, gambrel roofed houses, hedged gardens, and historic traditions, to the rugged cliffs and outreaching points where in former days cattle grazed, with not a tree for shelter from summer suns or winter storms. Those barren tracts of rock and scrubby bushes, where not even the hardy pine could brave the wintry blasts, have undergone a wonderful transformation since the days when George Bancroft, the historian, worked lovingly in his rose garden bordering the cliffs. Flowers of every description, trees of tender habit, and shrubs brought from far to the southward, have taken complacent possession of the waste places along the ocean front. Like the rest of America, Newport had its iron age, through which, for­tunately, it has long ago passed. Oh, the ugliness of the iron lions, the imita­tion marble statues, and the ubiquitous fountain, which symbolized the Vic­torian era! 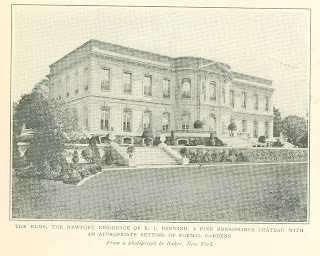 Its only redemption was the splendid luxuriance of turf which is Newport's one heritage from that period. 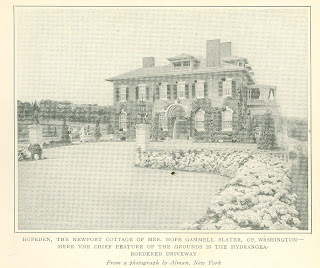 Climatic conditions are all in favor of the gardens of Newport. Very seldom are there long periods of hot, exhaust­ing sunshine. Even in July and August, rains and fogs come to mitigate the sum­mer heat, and to keep foliage and turf fresh and green. As for flowers - is there any flower which will not thrive in the Queen City? There is a distinctly personal touch to these domains; one knows instinctive­ly that all the planning and the tending have not been left to professional talent. 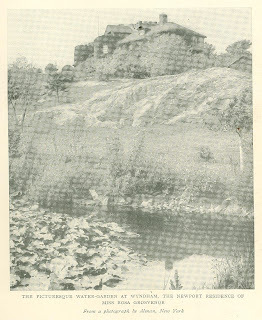 Glance, for instance, at Gray Crag, Mr. Mitchell Clark's castle on the frowning bluffs overlooking Sachuset Beach. The picturesque building so mingles with its background that at twilight it becomes a crag indeed. Gay, frivolous flowers have had no opportunity to tame and overrun the wildness of the land. They would be out of place in this environment. Hardy home grown shrubs and native pines and cedars soften the harsh­ness of the rocks, giving no hint of hav­ing been the afterthoughts of man and not the forethoughts of nature. The paths and bridges scaling the hills and crossing the ravines are stern necessities, and a part of the landscape. One of the finest views from the house is to be had from the rough hewn stone loggia, for nothing of man's work breaks the magnificent sweep of coast seen through the arched openings. One of the features of the interior of Gray Crag is the music room, in which Mrs. Clark's musicales are given during the summer. It has a strangely medieval aspect, with its high, narrow windows and its Mission furniture, gathered in the nooks and corners of old Spain. All noted musicians who visit Newport are welcomed at this castle on the bluffs. Mrs. Clark's interest in music is prac­tical, as well as artistic. A few years ago she invented a sounding board at­tachment for the piano, with which Paderewski was delighted. Gray Crag is an estate without a stable, the first of its kind in Newport. The gray, rough garage, apparently part of the massive stone wall, is hidden be­hind screens of cedars. This was a pet project of Mrs. Clark's, and has proved its value after three years trial. 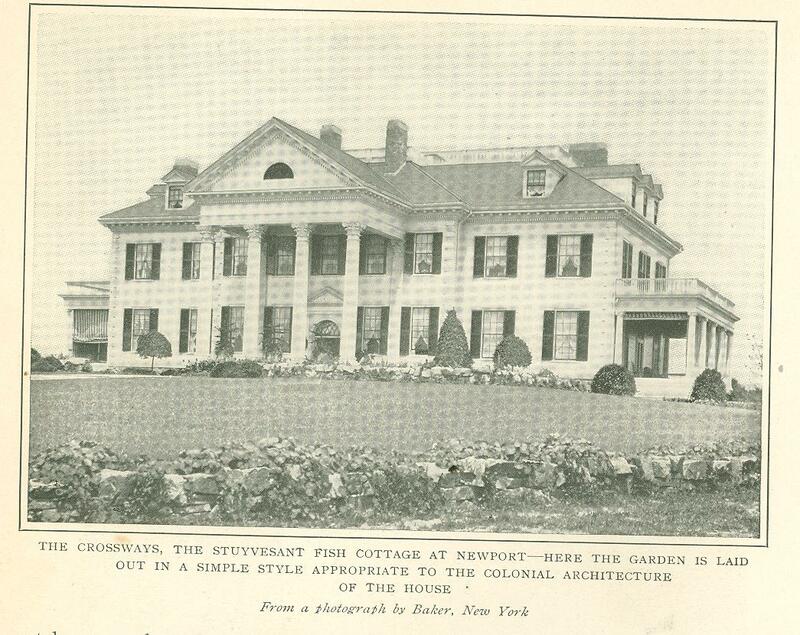 No Newport cottagers have had to deal with more refractory material than Mr. and Mrs. Hugh Auchincloss, the owners of Hammersmith Farm, on the Ocean Drive. Their estate lies on a high point of land which belonged, some two centuries ago, to one William Bren­ton, whose townhouse still stands on Spring Street, a relic of the past. It was rough, rugged ground, with rocky points breaking the water's edge, of little use save for grazing. Shade less and ex­posed to the blighting winter gales from Ocean and bay, to beautify it with flowers and greenery seemed an impossibility­ until Mrs. Auchincloss undertook its redemption six years ago, and literally wrested from rocks and winds a delight­ful and cleverly varied pleasance. The whole plan of the Hammersmith garden is not seen at once; it consists of a series of pictures to which one is led by a network of paths. Some of these paths are wild and rocky, leading over hillocks and boulders, and crossing rustic bridges and rough stone arches; others are cool and shady retreats, lined with laburnum or evergreens; and still others are prim and formal avenues, the proper approach to banks of roses and beds of flowering annuals. No two paths are alike, and no two sides of any path are alike. On one side may be a steep, grassy bank dotted with wild flowers; on the other, close planted bushes with delicately tinted foliage, or a mass of Japanese barberry with its tiny leaves and cheerful red berries. A hundred varieties of hardy plants have been brought here to subdue the rocks and to find a congenial home in spots that once were bare and inhospitable. 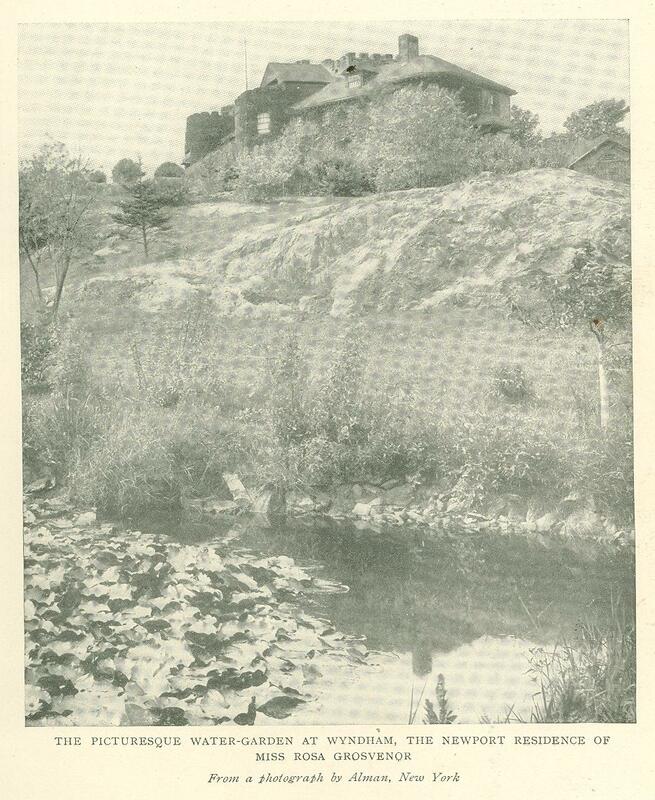 Another good example of the harmony between a house and its surroundings is shown at Wyndham, the hilltop home of Miss Rosa Grosvenor. From each ivy embowered window are water views - the ocean on one side, stretching to meet the calmer waters of the Sound; the bay on the other, rough or gentle as the winds may be, carpeted with is­lands and girt with rocks. William T. Richards, the marine artist, has fre­quently painted these waterscapes. No high trees detract from the low, artistic lines of the house; the only touches of cultivation are given by thick ­growing shrubs, an occasional hydran­gea, and red-ribbed cannas. The water­ garden at the foot of the rocks is a natural basin, the logical outcome of an incipient marsh. Here are water grasses and varicolored lilies, from the white with the aurora flush to the rose pink Cape Cod lily. Miss Grosvenor is a member of the Grosvenor family of Providence, whose name means so much to the business and educational side of Rhode Island life. 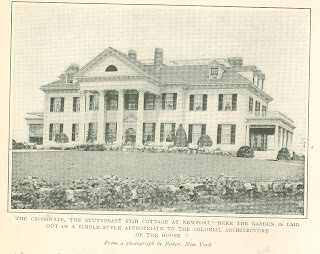 Her grounds adjoin those of her brother, William Grosvenor, who died last spring; and there is a community of interest between Wyndham and Roslyn - Mr. Grosvenor's estate - as the two establish­ments have a combination stable. Among the trees of Newport, none is more distinctively beautiful than the glossy leafed copper beech - a European immigrant which has flourished and mul­tiplied in the New World. 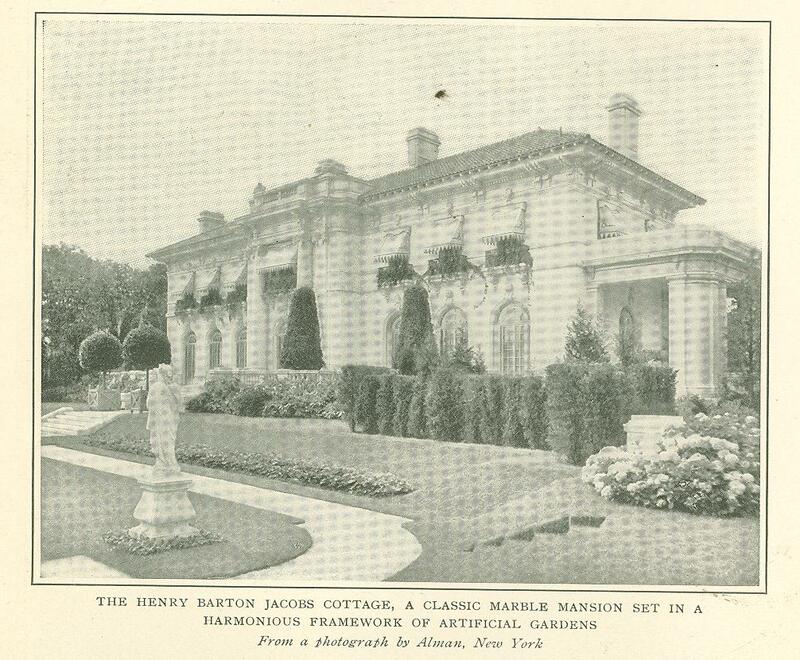 In the grounds of Dr. and Mrs. Henry Barton Jacobs's classic marble mansion, they form a framework that gives added dig­nity and stateliness. On all sides, this splendid house and its garden are in such friendly accord that one but completes the other. From the wide marble terrace a broad flight of steps leads into the Italian garden, where the staid, supercilious cedars bring the graceful statuary into relief. Mrs. Jacobs has given the correct color note to the whole by using red geraniums - hardy, hum­ble, yet rich and beautiful - for the nar­row side borders. A species of catalpa, which is a newcomer in the world of formal pleasances, but already a favor­ite, borders one of the pleached walks. As there is no view from the garden, it is in itself a complete picture, with­out a gap or an incongruity in formation or color. From the ivy covered arbor at the end of the garden, paths marked by two mar­ble figures lead to the rose and dahlia borders, which are set in an embrasure formed by a grove of sturdy oaks, and which brighten a corner that would otherwise be somber. Lemon verbena, once despised, but now come into its own, fills one nook with its subtle fra­grance all summer. It is no wonder that these gardens are the delight of both Dr. and Mrs. Jacobs, who have found in the task of developing them a wel­come relief from social and professional cares. Much of the statuary that beauti­fies. them was collected during a Euro­pean ttrip two years ago, when Dr. Jacobs, who is an authority on tuber­culosis, was invited to lecture before some of the German universities. 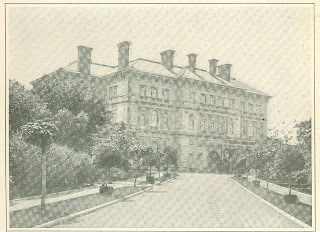 Mrs. Jacobs, it will be remembered, was the widow of the late Robert Garrett, well known as president of the Baltimore and Ohio Railroad and as a benefactor of Johns Hopkins University, in Baltimore. A garden that ranks among the finest examples of formal landscape art in America is that of Vernon Place, Mrs. Richard Gambrill's French chateau on Bellevue Avenue. Here every detail is perfect - a somewhat cold perfection, to be sure, to the nature devotee who revels in color and bloom run riot, and who scorns the devastating pruning knife; but a perfection most harmonious with its environment. Wild gardens of any description would be quite out of place on the avenue, with its stately mansions and compact grounds, where life is necessarily more formal than in the wider country beyond. Vernon Place thus typifies one phase of Newport life. The harmony between the house and its immediate surroundings' is absolute. The wall decorations of the loggias opening into the terraces on the north and south sides of the chateau reproduce the colors found without. The case­ments of the high-arched windows and doors are decorated with flowers grapes in their natural tones. The wood­work and ceilings are cream colored, the latter showing tropical birds in their brilliant plumage, and equally vivid flowers in natural positions. Even the rugs are in flower colors, so that as one passes through into the marble terraces overlooking the garden, there is no dis­cordant note in the transition from the pictured to the living scene. Here are bay trees and charming mar­ble figures in a setting of green sha­ding from the dull cedar to the silvery green of the graceful French maples. The delicate beauty of the bronze foun­tain is not marred by the proximity of any overpowering object, and every­where there is the suggestion of un-­crowded spaciousness. On the street side, by a clever use of white stucco walls hidden under screens of shrubs and vines, the bustling life of the town is completely obliterated. There are many signs that an everyday life is lived within these sheltering walls, each part of the garden is so distinctly usable and livable. On one of the ter­races, under the shelter of a large fern ­leaf beech, are comfortable white chairs and the round table where in the afternoons Mrs. Gambrill pours tea. On moonlight nights, coffee is served in what is then a garden of mystery, when even the marble statues seem instinct with life and the riant beauty of the flowers is chastened. An added charm to the picture are the pergolas, ornate and unusual, yet in per­fect sympathy with the finished elegance of the whole. The chatelaine of Ver­non Place has shown her appreciation of the value of balance in the selection and arrangement of the statues which distinguish these covered walks. They represent the seasons, and are so placed that they are parts of the garden, al­though not in it. They point unerring­ly to the flower bordered paths. which connect the pergolas with the French garden. The green garden of Chetwode has been developed by Mrs. William Storrs Wells with the idea of making it part of a large formal garden. The rubber ­leafed rhododendron is here used most successfully for the low, broad borders. Marble steps outlined with ivy, and the ivy covered urn in the center, blend har­moniously with the many shades of green. There is something indescribably refreshing in this sequestered garden. Grass walks are its connecting links with the house. In many instances where no flower­ gardens have been attempted, hydran­geas are used singly and in masses. 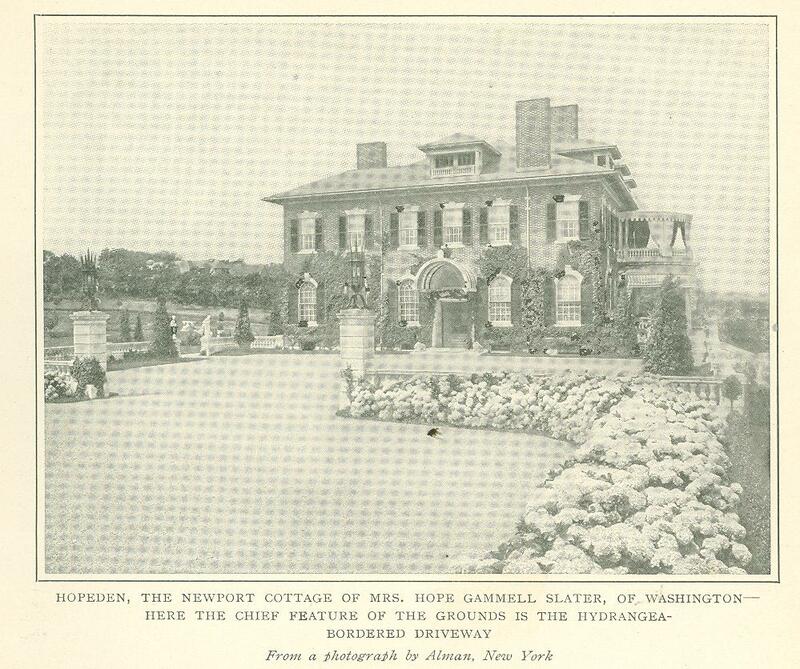 These highly decorative and spectacular bushes are too overpowering to be used successfully with less insistent flowers, but arranged as they have been at Hopeden - the residence of Mrs. Hope Gammell Slater, of Washington - they are in their proper sphere. Hopeden is at the beginning of the famous Cliff walk, and this hydrangea drive is a delightful pre­lude to the varied beauty of the Cliff gardens. Fountains will always play an impor­tant part in landscape gardening. At its best, a fountain is the queenly feature of the garden; at its worst, it may ruin the work of years. At the Elms, Edward J. Berwind's Newport estate, the fountain is artistic and massive. In the center of the walled court, it holds the attention through its sheer loveliness. Lilies float in the basin, and look modest­ly at the vine filled shells forming its base. The bronze figures upholding the urn are instinct with life and spirit. The marble balustrade enclosing this grass court forms the back of the basin, and thus brings it into proper focus with the rest of the garden. With so much beauty and loveliness at every turn, it is not surprising that even in this show town of America the beauty lover sees only the glory and charm of it all and seldom thinks of the cost - which is the truest compliment that can be paid to any work of art.